Video recorded in 2005. 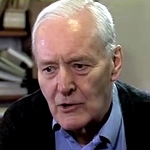 In a lively and entertaining interview, former UK Minister for Science Tony Benn discusses the interaction between scientists and politicians in an interview with Sir Harry Kroto. Benn, having spent a life-time as a leading politician closely associated with science and technology affairs informs us on how he went about taking advice from scientists on various major issues such as, nuclear power and weapons as well as the energy gap. He tells how he was lied to and badly advised about the safety and cost of nuclear power and why is he is now opposed to both nuclear weapons and civil nuclear power. How ‘Open Government’ is his answer to obtaining advice and freedom of information on scientific matters. He explains how he made his decisions on the funding of science and the real power of saying ‘No’ to force arguments on why some areas should be funded. Benn gives an insight into the influence that Civil Servants have on aims and decisions and the role of the Science Advisor to Government including the dismissal of Walter Marshall during his role as Minister. The difficulties of taking responsibility for decisions (ie. Bush on petrol) are also discussed in the light of the fact that government is ever-changing. Many other issues such as the under-estimation of the intelligence of the general public, proportional representation, communism, capitalism and democracy are themes touched upon. Benn stresses that his ‘main interest in life is to work for democratic structures and a part in controlling our own future’. On the subject of ‘not enough young people going into science’ Benn says the problem should be open to public debate, that Market Forces dictate financial rewards and the sensible answer is government intervention and planning for more scientists. On ‘Scientists’ responsibility for their Science’ Benn supports the work of Rotblat, Bernal and others. Last but not least, on religion Benn talks about his personal beliefs and up-bringing. He discusses the influence on him of such quotations as ‘dare to stand alone, dare to have a purpose……’ and how such quotations from the bible as ‘live in peace - love thy neighbour - my brother’s keeper’ and other teachings interest him as social science but have been open to manipulation.